Playing equally well as both a depiction of tested familial bonds and as an investigation into language, humanity and identity, Still Alice is an emotional and intellectual success. Perhaps unsurprisingly the film’s strongest element is Julianne Moore given both her Academy Award win for the role and her boundless capabilities as a performer. Her work here grants the film its soul with her intelligent and finely observed performance. But alongside her work sits a performance that’s also highly deserving of praise, Kristen Stewart lights up the screen playing Moore’s daughter with a wit and strength that marks her as one of the most interesting developing talents in the industry. 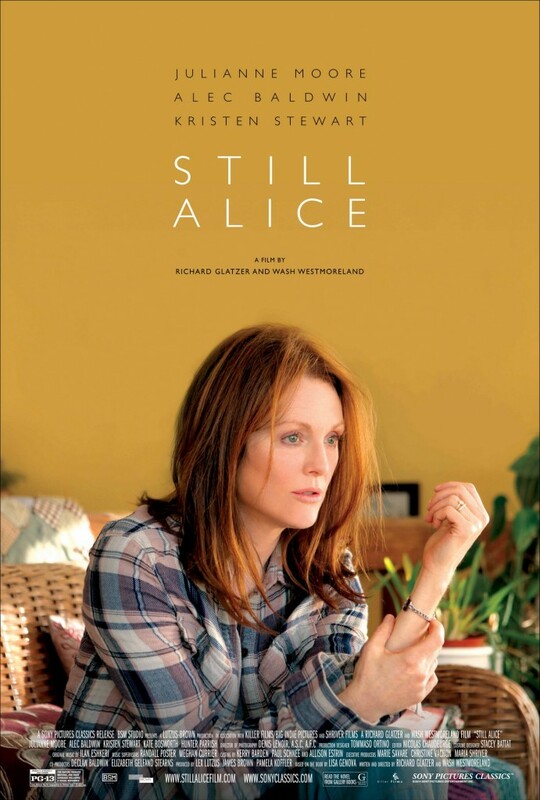 Despite running the risk of playing as a cheap conceit Still Alice benefits from having Julianne Moore as a linguistics professor becasue it serves to amplify her degeneration once she is diagnosed with early onset Alzheimer’s disease. As the character herself notes she is a woman defined by her intellect and her supple linguistic ability. As that begins to break apart we are left to ask ourselves what define’s us, both in our own and other’s minds and how do perceptions shift when that definition is removed. As she describes how the words that she wants to say seem to hang in front of her and yet she is unable to verbalise them the film takes on a chilling edge greater than that which you would find in most horrors. It is perhaps impossible to truly represent the disease in all of its complexity on screen but the film makes a very valid effort and really succeeds at conveying the horrific concept of having your ability to communicate stripped away. Although the film does occasionally have a television movie feel to it Moore and Stewart’s performances elevate the material enough to keep it feeling like the moving drama it is at heart rather than the made for TV show it occasionally threatens to become. The saving grace on the filmmakers behalf is that the film doesn’t try and tell the story from the family’s perspective, an approach which would almost inevitably alienate and other Moore’s character. Instead we see and experience her story and gain enough insight into the family and how each member copes with the disease through how they interact with her. This is a story of information being shared and new bonds forged between members in the light of and insights granted by a disease that’s slowly eating away at those bonds and memories. Occasionally the film is a little clumsy and doesn’t trust Moore enough and overcompensates with its score and a slightly saccharine scene in which she delivers a speech to a crowd of smiling audience members. It’s too on the nose and the film suffers from moments like these. However when the film is at its best it gives a rich script to Moore and Stewart which they then run with and give us two of the best performances of the year. Moore’s Academy Award win is entirely deserved, despite being up against the formidable Marion Cotillard in Two Days, One Night, but what we should really take away from this is Kristen Stewart who has put Twilight firmly behind her and is rapidly turning into one of the most promising actresses of her generation. What is the film’s greatest strength? Julianne Moore’s fantastic performance. Its greatest weakness? It’s script occasionally threatens to head into TV movie territory, Moore’s speech giving scene being a prime example. Would I see it again? Absolutely, it ranks amongst both Moore’s and Stewart’s very best work. Great review. You know I prefer Marion’s work but Julianne was great in this, even if the film for me was a bit forgettable (no pun intended). Liked Kristen Stewart and also thought Kate Bosworth was pretty solid. Thank you! I thought the film was decent but it was really elevated by Moore’s work. Marion and Julianne are my two favourite actresses so you preferring Cotillard is fine by me my friend! Yeah I am actually with Mikey on that, I had more than enough opportunity to watch this at the local indie cinema but I just couldn’t muster the strength. I know this is going to be a heartbreaking film to watch. And hopefully it comes across as a compliment that Julianne Moore’s talent will only make that fear a reality! Nice work though James. I just may give it a shot sometime when I’m brave. I think it’s fair to say that whilst the film is very sad it also celebrates her fight and the family unit… it’s triumphant in the face of tragedy. Excellent review, I’ll be watching this very soon I hope. I’ll be sure to let you know what I thought of it. I so badly wanted to see this but it was only on at my local cinema for about a week before vanishing completely. That’s a shame… I too missed the chance to see it in theatres and have had to catch it on the small screen instead. ← FrightFest Announces Its Guest Line-up‏!